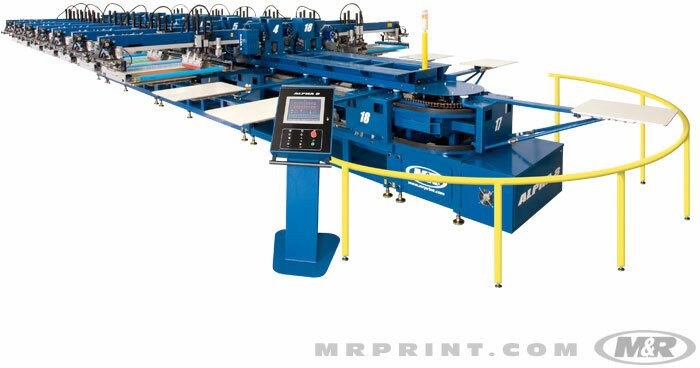 M&R Alpha 8 Automatic Screen Printing Press - RC Screen Shop & Supply Co.
Alpha 8 is M&R’s exciting new take on the oval-shaped press. Categories: Equipment, M&R equipment. 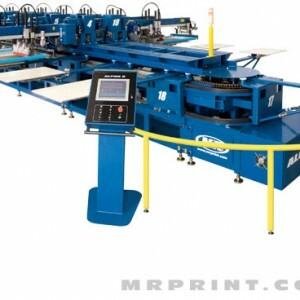 Tags: Automatic press, equipment, M&R. Alpha 8 is M&R’s exciting new take on the oval-shaped press. It’s modular and expandable—and can be configured for almost any production requirement. Since Alpha 8’s oval shape takes up less floor space than comparable carousel presses, it makes more efficient use of available production area. This also allows the Alpha 8 to fit into spots where no carousel press could. Alpha 8 is available in 3 models: Alpha 8 5070, Alpha 8 6080, and Alpha 8 80110. These offer maximum image areas of 50 x 70 cm (20” x 28”), 60 x 84 cm (24” x 33”) and 80 x 110 cm (31.5” x 43.5″), respectively. Double-index mode on alternating printheads can produce images up to 99 cm x 70 cm (39” x 28”) on the 5070, 109 cm x 84 cm (43” x 33”) on the 6080, and 114 x 110 cm (45″ x 43.5″) on the 80110. The 8-station Base/Drive Module supports up to four printheads, while M&R’s Plug & Print™ modular design provides for expansion—in six-station increments—up to 62 stations on Alpha 8 5070 & 6080, and up to 50 stations on Alpha 8 80110. Alpha 8’s digital touch-screen control panel with icon-based labeling can display information and commands in numerous languages, simplifying press operation and training anywhere in the world. Alpha 8 incorporates a sophisticated servo-drive indexing system that combines extremely high speed with smooth operation and precise control. It also incorporates multiple-indexing capability, which allows virtually unlimited load/unload scenarios. Alpha 8’s design allows users to start with as many—or few—printheads as they need, and add more as their needs change. Other than the end stations, there are no restrictions on printhead placement. All other stations can support printheads—and any station can be left open. Alpha 8 even allows users to change the placement of load/unload stations for maximum efficiency. No textile press is more flexible. Hooded sweatshirts, pant legs, cut pieces, T-shirts, and most other types of textiles can be easily loaded and properly located on the Alpha 8, maximizing production and flexibility. Alpha 8 is also an ideal press for oversize printing. Alpha 8’s printheads are driven by fast, reliable variable-frequency AC drive motors, and include simple print-stroke adjustment, allowing very high production rates. These printheads also incorporate an elegantly simple method of adjusting off-contact at all four corners of the screen frame quickly and independently—all without tools! Alpha 8’s high-lift mode simplifies access to the underside of the screen and allows fast, tool-free placement of flash cure units at any station. Rear micro-registration and locking front micro-registration with visual guides help ensure ultra-precise screen positioning.